How long was Black Mountain in the works? From the ‘eureka’ moment to launch was over seven years ago now. My background is in motorsport engineering, and working with the likes of F1 and World Superbike companies meant I knew design, testing and refinement were things that were not to be rushed. Our EPOK series is by far the most advanced kid’s bikes ever made – with a three-piece hydro-formed aluminium frame, three riding modes, two stage belt drive system and ‘one-turn’ belt tensioning. The bikes surpass the International Children’s Bike Safety Standard ISO 8098 (not all kids’ bikes brands do! ), and more than 80 per cent of the bike’s parts are custom designed, tooled and manufactured by Black Mountain. So it’s not ‘just another lightweight kids’ bike’ that’s been thrown together overnight from catalogue parts. Talk us through your seven-year route to launch. It all started when I naively bought a bike for my then five-year-old son from a large high street retailer. It resembled a bike, but was incredibly heavy, the brakes didn’t work properly, the gearing was too hard, and the bars were up somewhere around his chin… it was wrong, just wrong. And the worst thing? My son soon grew out of it, both in terms of size and gearing. Conventional bike frames for kids just didn’t make sense to me. They missed the point that kids are growing and pedalling stronger every day. What I recognised was that the current kids’ bikes – even the ‘best ones’ – were not truly designed for their user. They were designed to fit and be suitable only for a very short period, and then reliant on selling-on as second hand to recoup the parents’ investment and buy the next appropriate bike. This may work for some people, but it struck me as a crude solution to the problem. I decided there and then that I could do a better job, so I set about the task of designing a bike that would grow with your child. I started out in my garden shed making models out of Lego, then foam, and then bits of old bikes and steel. The first prototypes were crude, but they made me realise that my ideas would work. I started really studying my kids’ riding development, from them learning to balance, to then using gears, and this research led to the development of our EPOK series of bikes. We all know that kids grow, and that makes choosing the right size of bike a real challenge – so a growing bike is the natural solution. But more than that, when teaching my kids to ride, I realised how significant the ‘stages’ of riding were. From not being able to balance, to balancing. From trying to pedal, with little power and smoothness, to pedalling well. These three core stages each need a bike designed for that purpose – firstly a balance bike without distracting pedals. Then a small wheel (say 12”), low-geared pedal bike to teach pedalling muscle memory and develop power (especially when learning on soft ground and grass). Then as power and rider size increases, a larger wheeled (say 14”) pedal bike as the rider is now bigger, more efficient and riding faster and more confidently. Any bike you could buy back then was just ‘one’ of these bikes – and as these stages all come within a 6-18 month period, it struck me as a major design failure. In 2014, things stepped up a gear when I employed Greg Hampton, a talented product and industrial designer. 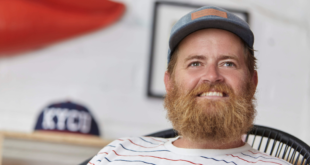 Greg became lead designer and took on all of my ideas, drawings and prototypes and set to the task of making them into something tangible, a real working bike that could be manufactured and sold to the public. A lot has happened in the time that Greg has been on board. We now have full production of our two models (the PINTO and SKØG), a showroom, warehouse and six members of staff, with more models on the way. What has been the overall reaction to Black Mountain products so far? Blown away – we soft-launched in the UK, and in the eight weeks of business we had sold to over 20 countries. Our press reaction has been so positive. We knew how well the growing features of our bikes would work – and we’re really pleased to see how well the bikes are fitting kids, and growing with them during their riding and physical development. But we’re really chuffed by how well the bikes ride. We’ve taken a much more modern approach to geometry and riding positions. With lower bars, a short stereal proof in the pudding has been to see hundreds of kids riding well, quickly and with great stability, and parents are really noticing this – how quickly their child has learned to ride well on our bikes – it makes us feel great. What does the future hold for Black Mountain? We have some really exciting models coming out later in the year, including the big brother to our 16” SKØG bike. We are also working on some interesting trade/bike shop packages and will be rolling that out later this year, but already we’re really pleased from the interest from LBS’s. We see a genuine opportunity to work with good speciality LBSs, we think they are still a vital part of the child and family cycling market, for advice and support beyond what we can offer as an online brand. Our trade programmes will address the conflicts and challenges between the ‘online’ model and the traditional wholesale approach. 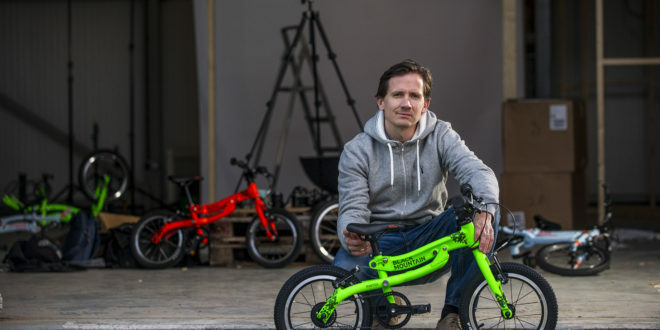 So not only have Black Mountain revolutionised kids’ bikes, but we’re also revolutionising how kids’ bikes are distributed.